Satellite-launch company VirginOrbit has conducted the first successful test flight if its LauncherOne rocket. The carbon-fiber, two-stage rocket was carried under the left wing of Cosmic Girl, the company’s customized 747 passenger aircraft, on November 18 after it took off from a test facility in Victorville, California. Virgin Orbit CEO Dan Hart described the 80-minute test flight as “picture-perfect and a major step forward in our quest to bring a new capability to small satellite launch”. The flight crew assessed the take-off, landing, and low-speed handling and performance of the integrated system during the flight. Virgin Orbit’s chief pilot Kelly Latimer said, “The vehicles flew like a dream today. Everyone on the flight crew and all of our colleagues on the ground were extremely happy with the data we saw from the instruments on-board the aircraft, in the pylon, and on the rocket itself. The 70ft long, 57,000 lb (25,800kg) LauncherOne rocket is designed to travel at speeds of up to 20 times the speed of sound (17,000mph) and will carry small satellites, such as communications and weather satellites of up to 660 lb (300kg). For a launch the rocket will be flown to 30,000ft, and released before its thrusters fire to take it into space. 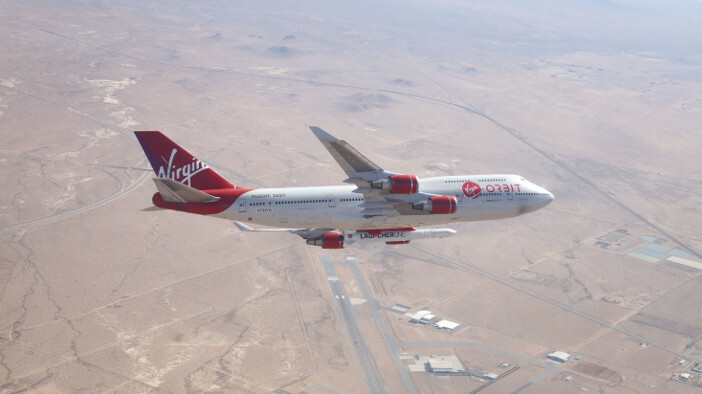 The “captive carry” test flight marks the start of a new phase in Virgin Orbit’s test program. The next tests will focus on further proving the robustness of the modified 747, the carbon-fiber rocket itself, and the performance of its onboard avionics and flight computers. This will include a drop test, during which a rocket will be released from Cosmic Girl — without igniting — to generate data about Cosmic Girl’s and the rocket’s performance as it freefalls through the atmosphere. Virgin Orbit plans to put its first payload into orbit in early 2019. The company then expects to conduct multiple trips to orbit in the year ahead, and has already begun to build, test and integrate the rockets for those subsequent missions at its manufacturing facility in Long Beach, California.